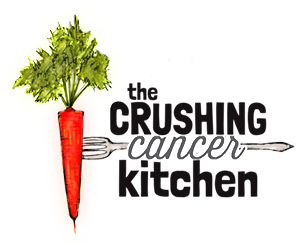 When you have cancer and are going through/recovering from treatment, hot sauce is probably not very high on the list of things you want to have going into (or coming out of) your body. Generally, you want nourishing, comforting recipes like this or this, not food-fire to aggravate your physically and emotionally stressed out body parts. 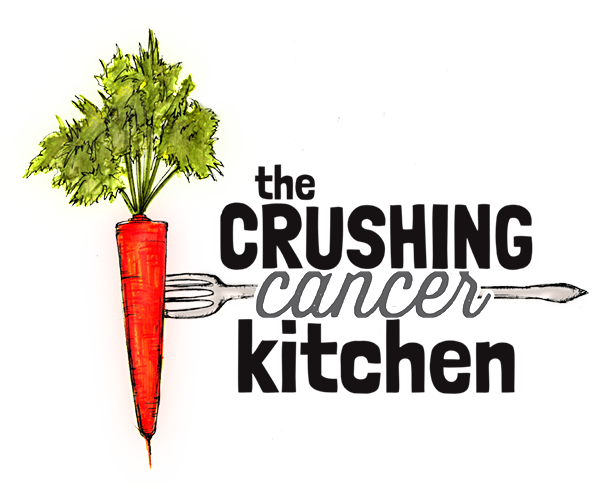 However, I know from experience that often when people are diagnosed and start to change their diet and lifestyle, they start to look at the diet and lifestyle of those they love too. Besides your own health, nothing provokes healthy change enthusiasm more than the health of our loved ones. 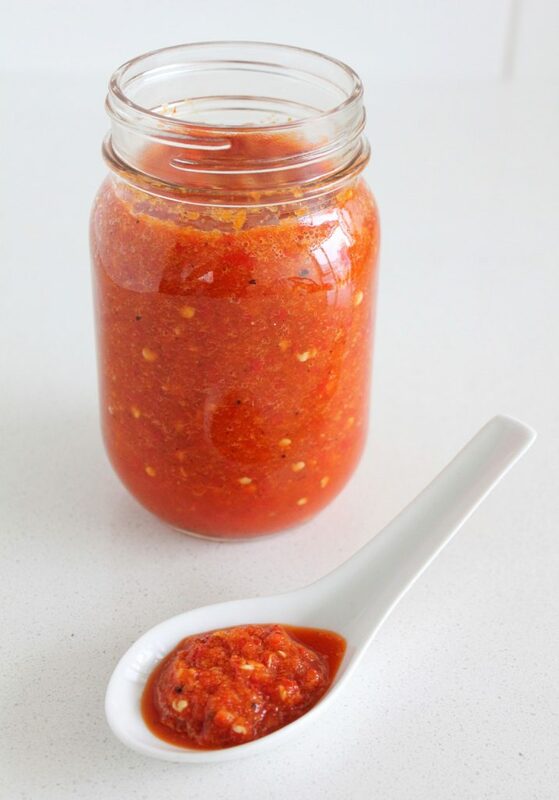 So this recipe is for you if you still buy your hot sauce but have started reading labels, or it’s a recipe to forward to (or make for) your kids, partner, roommate, good friend, neighbour who waters your plants or favourite co-worker. 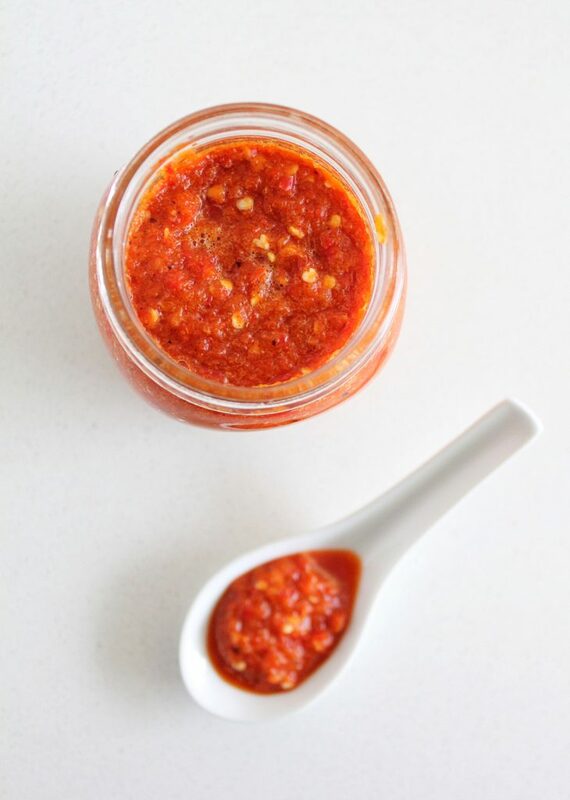 What they will think they are getting: really flavourful hot sauce, handmade by one of their favourite people who remembered that they love spicy food. 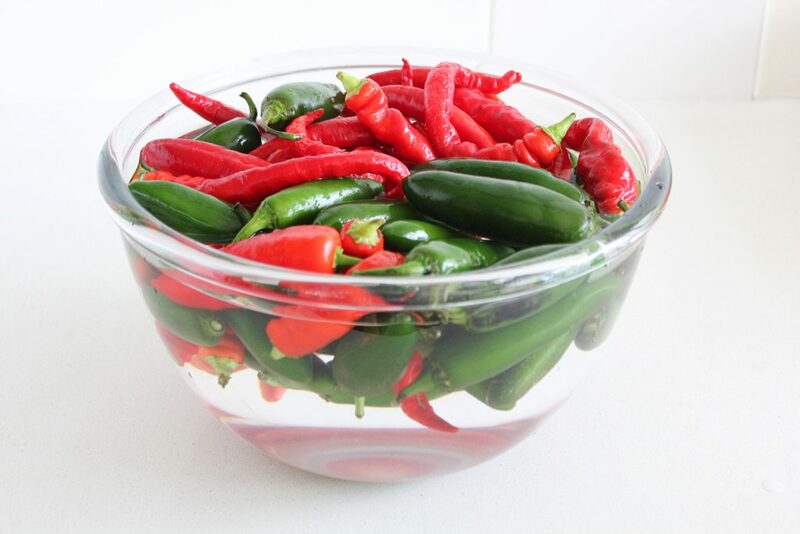 What they are actually getting: all of that plus the active probiotics that the fermentation step brings, organic, local chilies that are at the top of their nutrition game with an abundant of vitamin C (red chilies) or vitamin A (green chilies) and antioxidants, a boost in blood and chi circulation, help with bronchial problems, colds, fevers and varicose veins (this isn’t generally a cancer problem, but a pesky pregnancy problem) (I know two people who will be getting a jar of this), and protection from some carcinogens. And that’s before we even get into the mineral-rich (but not detectable in flavour) seaweed, the anti-inflammatory powers of fresh turmeric (not overly detectable either, if anything it gives this a mustard vibe), and from the allium family of cancer-crushers, red onions and garlic (although raw, they are pickled in the fermentation process, so not too pungent and just add a savory hug). 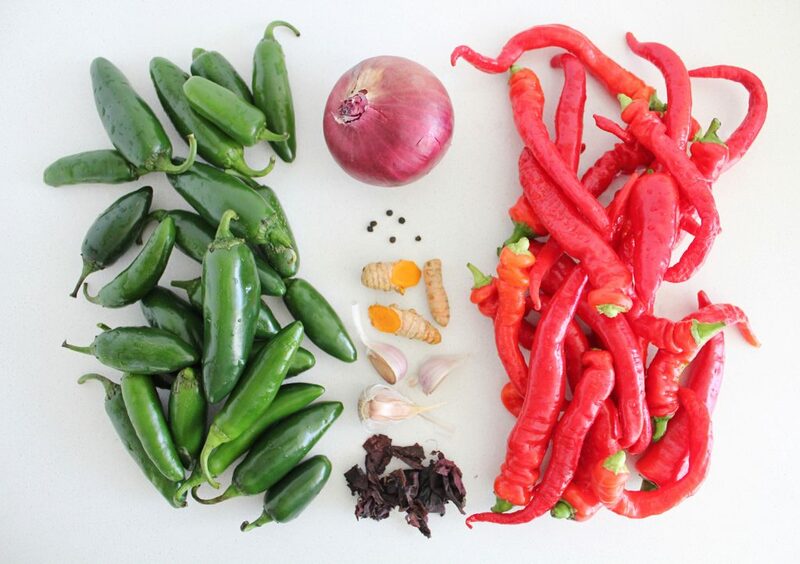 which indicate they will be extra spicy, so they were way hotter than the red ones. 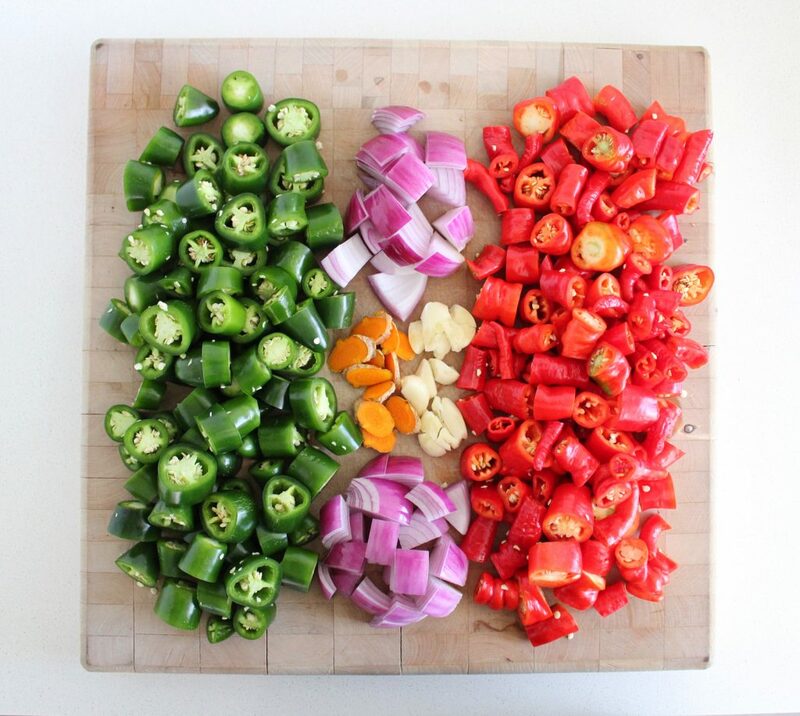 Feel free to mix and match to suit your taste or even throw in some bell peppers to cut the heat and sweeten things up. 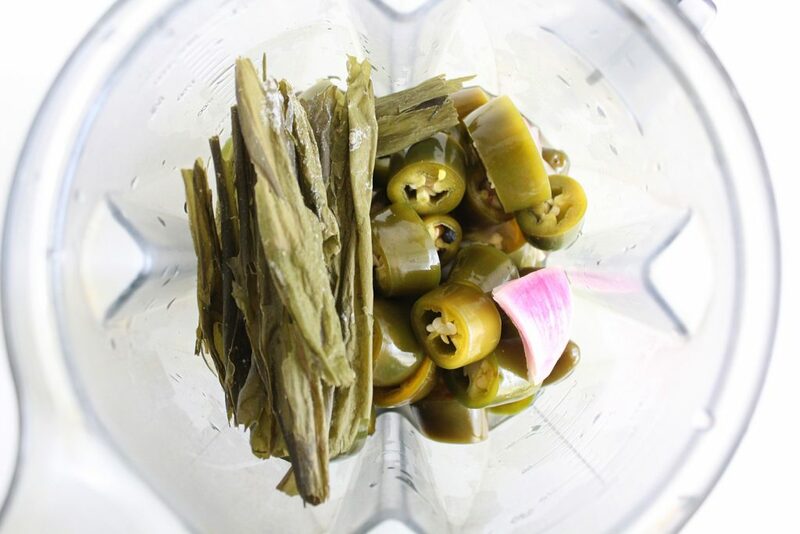 A practical reason to include some green chilies is so that you can see when the natural lactic acid starts to form during the fermentation process. 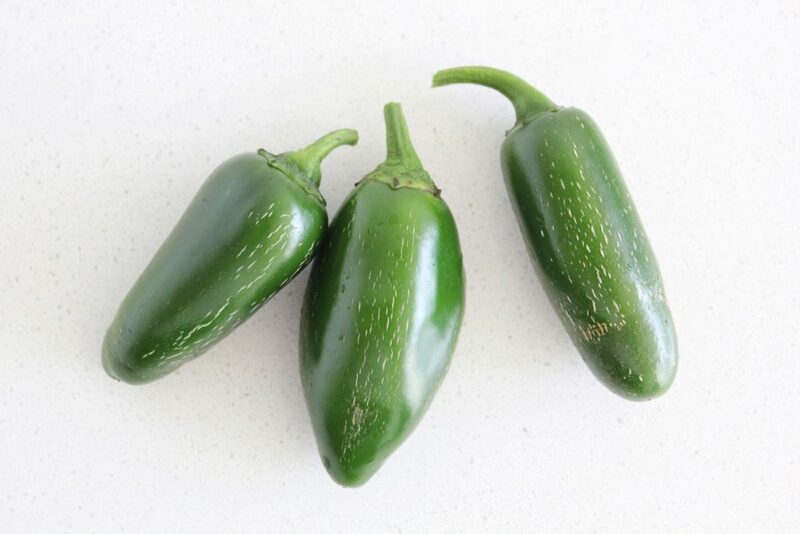 When the green chilies essentially get pickled, they will turn browny-green (picture anything green and pickled, the vibrant green colour is always the first to go). This is how you know the fermentation is happening. 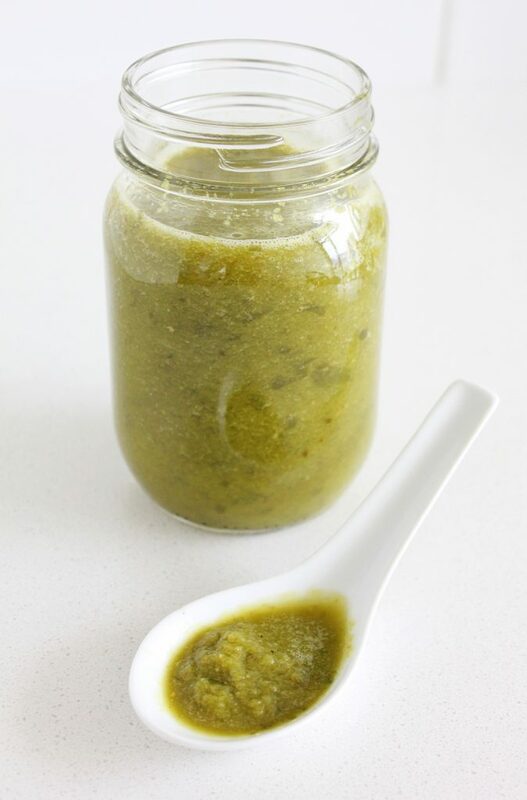 There is some irony in warning you to think of your colon before dousing your Sweet Potato Avocado Toast with this, when it’s so full of friendly colon-loving bacteria, but the heat can be too much if you’ve been going through treatment, so be careful. 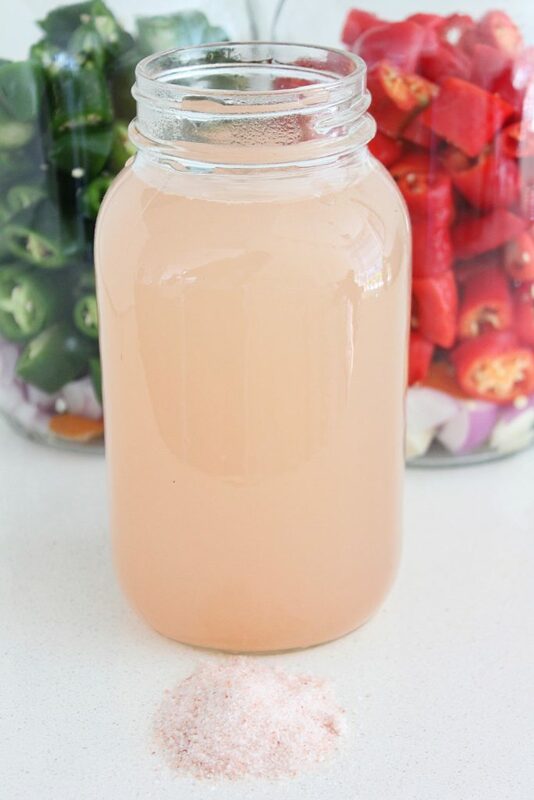 It does last for several months though, so you could make it now with the farmers’ market chilies and gaze at it in your fridge until you feel ready for it. In a small pot, heat the water and add the salt, stirring on medium/low heat until the salt dissolves. Add it to the rest of the water (in a bowl or jug?) to bring everything back to room temperature-ish. 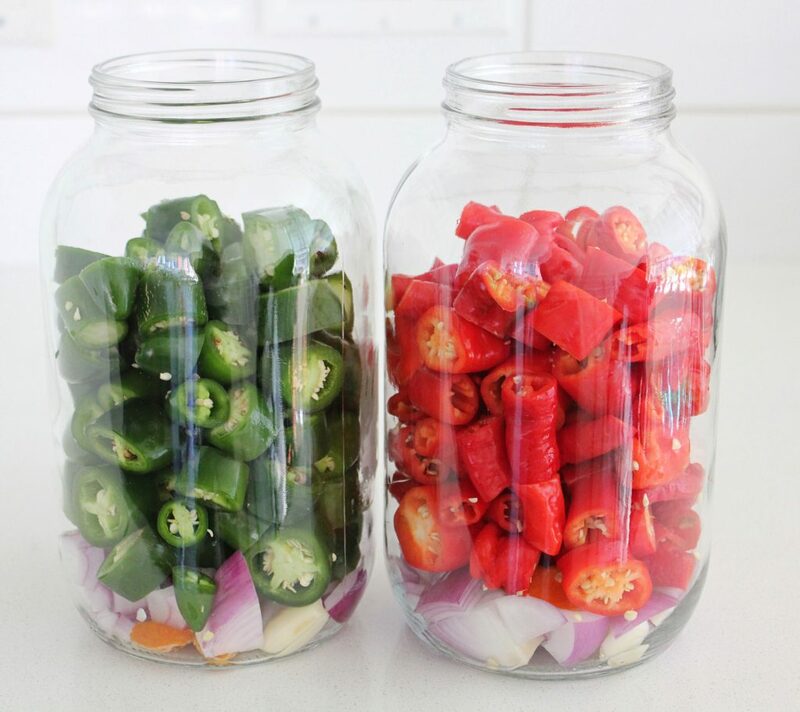 In a large jar, crock or mason jars, put the onions, garlic, turmeric, topped by the chopped chili peppers. Pour the room temperature brine over top until covered (make a little more if you need to, to cover it). Weigh it down with fermenting weights or a cabbage or lettuce leaf (that must be submerged too) any weight works, just be sure it's not metal, which reacts with ferments. Cover with a loose-fitting lid (or a proper fermentation lid if you have one), leave out of the direct sun for 3-5 days, depending on how warm it is (the warmer, the faster it will ferment) and how thick the walls of your chilies are and how big you cut them, checking on it from time to time to make sure everything is submerged and to remove floaties (or re-submerge them). 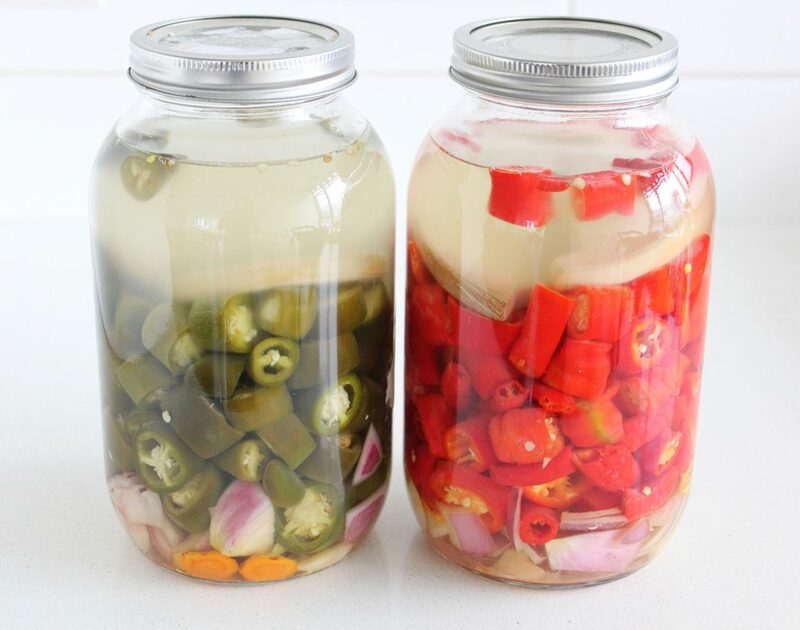 After a few days, you'll notice the brine goes cloudy and if you use green chilies, you will notice they lose their vibrant green colour and turn brownish. This means that the acidity is now present, and your ferment is ready (otherwise, just smell or taste for acidity). Strain the liquid from the solids. 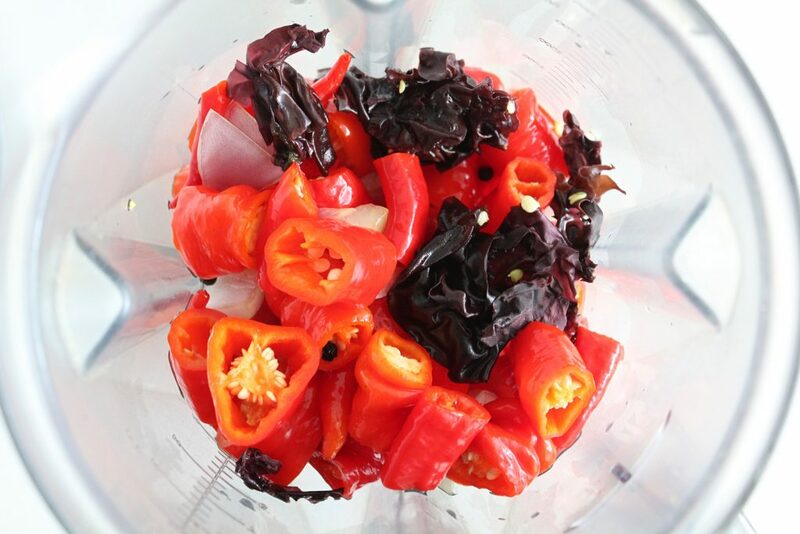 Put the solids, plus the seaweed and the peppercorns and add as much of the liquid to make it easy to blend and then add more until your hot sauce is at the desired consistency (you'll probably use half of the liquid). 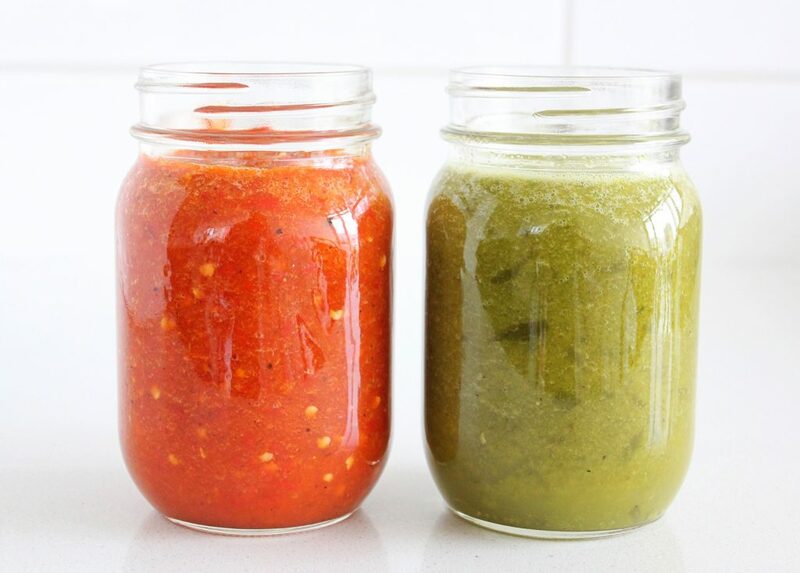 Store in a glass jar in the fridge for for 3-4+ months (and shake/stir before using). I have read that this will keep in the fridge for maybe a year, I notice you say 3-4 months. Any comments? Many thanks, this is fizzing in my kitchen as I type this.